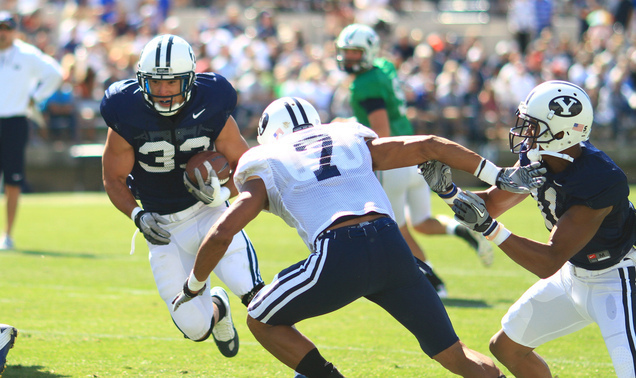 Early Saturday morning, BYU coaches decided to implement more special-teams work into the scrimmage scheduled later that day, departing a bit from an earlier plan that called for almost the entire focus to be on offensive and defensive plays. It didn’t take long for them to regret the change. Iona Pritchard, a sophomore from Bingham High who recently returned from a church mission and was in a battle to be the starting fullback, suffered a fractured fibula and dislocated ankle on the first play of the scrimmage, a kickoff return. Trainer Kevin Morris said Pritchard, who was showing great promise as a running back after making the switch from linebacker, is lost for the season.